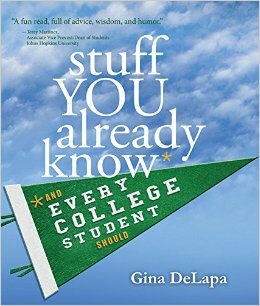 Stuff You Already Know: And Every College Student Should by Gina DeLapa was a book that Monkey Boy and I are co-reviewing. Both of us read through the book and are sharing our views on the book here in this post. This book written by Gina DeLapa is divided into three main parts. Gina talks about you need to know when you just entered collage, succeeding during the college years and deciding on what to do after you have completed college. The 367 nuggets which she provided in the book gives one an insight to how to survive the collage years. It gives one a perspective of what to expect and how to fully utilize the time that one has in college to explore and learn about what is most suitable field that one should pursue. College is a great time to learn as much as you can from life outside the classroom. It is a great time to discover yourself and learn about your strengths and weaknesses. It is a time where one can experiment within limits and have a deeper understanding about how one’s action affects decision making and your potential career path. I really enjoyed reading through the anecdotes that Gina had dished out generously in her book. It would certainly have helped me make better use of the time I had when I was in college some 20 years ago. I would certainly be more adventurous and try out the different subject combinations which I was entitled to instead of sticking to the “SAFE” subjects within the degree that I had chosen. I also would have spent more time building up relationships with others as it would have been a great opportunity to do some networking. He found the book really interesting . Even though he is still far from entering college it did give him a glimpse of how it would be like for him if he were going to college. It was an eye opener for him reading about what how it will be for him in the future when he enters college in time to come. I do recommend this book if you have kids who will be going off to college soon.